Language: ENGLISH, if not otherwise stated. This session will reconsider the work of Laibach Kunst and aim for a fresh evaluation of the relations and references to its sources and to its contemporaries. What was and is Laibach Kunst, and how can it be read in relation to the ongoing construction of history? What is the context of the formation of Laibach Kunst, the logic of its existence, its internal paradoxes, implications, its overt and covert agendas? In the light of the ambivalent threat/promise that its artistic, musical and performative manifestations implied for Yugoslav civil society, it is necessary to consider the total background and daily context of both sender and receiver. That is, the condition of both Laibach Kunst and its audiences. How was it that the Yugoslav authorities were paralysed by a small militant group of young provocateurs? Laibach's holistic approach to art, music, text, propaganda, cut-ups, mockery, bluffing, appropriation, poeticised fatalism, the rejection of authorship generated a vague and oscillating range of perceptions producing various assumptions, accusations of extremism or theoretical association with conceptual art practices on the one hand, and Lacanian psychoanalysis on the other. Yet none of these interpretations are quite able to define the entirety and complexity of the phenomenon. The work of Laibach Kunst represents a many sided referentiality, which, no matter what form it assumes, always points towards culture's systemically affirmative function and the perverted state of the spectator-consumer. 11:00: Guided tour through LaFarge Cementarna Trbovlje (Cement Factory)* The bus will leave Ljubljana at 10:00 and make its first stop at the Cement Factory in Trbovlje, where visitors will have the chance to see this impressive old factory from the inside. At 12:45, symposium visitors and speakers will be taken to Delavski dom. 13:30: Introduction: Alexei Monroe will give an introduction to the context of the exhibition and the symposium at Delavski Dom Trbovlje. He will present an overview of the 3 day symposium programme and the participating speakers of the first session. The first session of the day will recount the first appearance of the group Laibach in their hometown Trbovlje, the Trbovlje context and the now historic events that followed their banned exhibition at Delavski Dom in 1980. 13:45 Talk (Slovene language): Aleš Leko Gulič, prof.
will refelect on the industrial and cultural history of Trbovlje in relation to Laibach and its artistic development. The importance of avant-garde action to Trbovlje with its traditional working class environment will be discussed. This talk will present a comparative view on the Slovene Avant-Gardes, with a focus on performative practices and their local condition. The Laibach strategy will be placed in relation to the cultural movements of the 1920s and 1980s, discussing the respective locations and contexts where these actions took place. 15:15 Talk (Slovene language): Barbara Borčić (art historian, curator & publicist, director of SCCA-Ljubljana) will reconsider early events and exhibitions that intensively shaped the public image of Laibach Kunst. As director of ŠKUC Gallery in Ljubljana during the early 80s, she was involved in the turbulent alternative scene which triggered and supported also the art practice of the Laibach Group. In the following years she witnessed directly the proliferation and effects of Laibach Kunst visuals and messages into the Slovene (sub)cultural scene and the general public of Yugoslavia as well as their breakthrough into the international music arena. This session will focus on the Laibach`s strategies of appropriating different forms of representation from various spheres. This session will highlight selected aspects of the Laibach Kunst practice from these different perspectives: as conceptual art practice, as pop media phenomenon and as a form of cultural dissidence. will examine early Punk as a political event ‘an sich’ and the proposal of Laibach as continuation of Punk by other means – ‘für sich?’ after the Nazi-Punk scandal, also their impact on Yugoslav and Slovenian politics & state, and especially the then and now of the relation between Punk & Laibach as cultural praxis and cultural theory. In this context he will attempt to evaluate the current state of media & cultural influence of the 1980s alternative culture in relation to the mainstream media and the state bureaucracy. Laibach music will be contextualised with regard to its environment: an alternative sound-event of profound significance. Mark Terkessidis will focus on the strategy of sampling and covering which became a significant practice in the work of Laibach Kunst throughout the 1980s, as a way to expose the "affirmative culture" of a given political system. This kind of aesthetic criticism was quite common in "underground" music in those days. The presentation will raise the question how an if an aesthetic critique of aesthetics works. For this panel discussion we have invited protagonists of the 1980s alternative culture Laibach was part of. Coming from ex-Yugoslavia and Britain, two of Laibach’s most significant stages, they will share their respective “eye witness accounts” of key Laibach events of the 1980s. This discussion will attempt to dissect the underlying ideological confrontations that created and still re-create a specific sender-receiver situation between Laibach and its audiences over 30 years. Rather than indulging in nostalgic story–telling, the aim is to concentrate on an actualisation of the conceptual artistic strategies that made Laibach more than conventional stage performers. How can we review and evaluate these historical actions today and what was and is the systemic function of the rock stage? The official ban that prohibited the use of the name Laibach combined with a continuous growth of interest in the mode of aesthetics the group practiced necessitated and facilitated the spread of such aesthetics into new contexts. 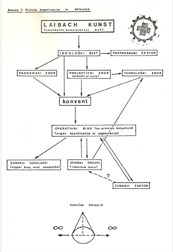 This plus personal and conceptual affinities within the Slovene arts scene led to the formation of NSK in 1984. Drawing on the conceptual and visual resources already laid out by Laibach Kunst, the NSK groups gradually developed individual approaches, concepts and viewpoints from out of the collective framework of NSK. Although NSK carried out only a relatively small number of collective public presentations, dramas and other ceremonial performances certain shared motifs and a collective iconography) the collective platform served as a cultural antidote, an actually-existing gravitational force in the Slovenian cultural scene of the 1980s. Much has been said and written about NSK already, yet there remains a space for a more intensive re(tro)-definition of its activities and modes of operation. The session will analyse the different practices and viewpoints within this (historic) formation while taking into account the remaining bonds to the current practices of its member collectives. Collectivism and the establishment of a militant and conceptually radical cultural centre of gravity will be central to the discussion. 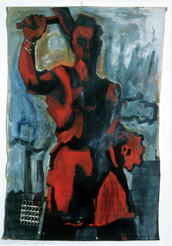 NSK's practice was based on the existence of a coherent “other”- the socialist state and its condition throughout the 1980s. When discussing the end of NSK, we need to look back at the end of Yugoslavia as such- reconsidering the wider historical context and how this fed into and produced certain cultural necessities. The formation of the Neue Slowenische Kunst collective, the conditions and relations that caused its emergence will be central to this session. We will reflect on the art historical and political/philosophical context and implication of NSK as a platform for various cultural activities. As a social construction seeking symbolic expansion beyond the domain of art, NSK was bearing notions of exclusiveness, control and militant social organisation, which, on a surface level, presented a potential threat to the authorities. NSKs cultural activities may be regarded as a factor within the Slovenian civil societies motion towards independence and ‘liberation’ from the degrading system of Self-management. However, numerous and often paradoxical perspectives on the “phenomenon” are possible. will discuss the different practices of the NSK groups with regard to their historical context of Yugoslav Avantgardes. The establishment of (semantic) self-positioning within this context is a central aspect to the concepts of the NSK groups. Definitions and distinctions between notions such as Retro-Avantgarde, Retro-Principle, Retro-Garde on the one hand, and the multiple references to the historical avantgardes on the other hand, will be subject of this close examination. will reflect on the question whether artistic agency and utopian projects can actually serve as options for civil political engagement and cultural progress. Can the Laibach and NSK be regarded as a potential platform for social activism and how can we describe their difference to other subcultural or “dissident” practices of the time? This session will reconsider key historical moments of NSK and its constituent groups. The unforseeable and still-unfolding consequences of their historic actions will be explored here. 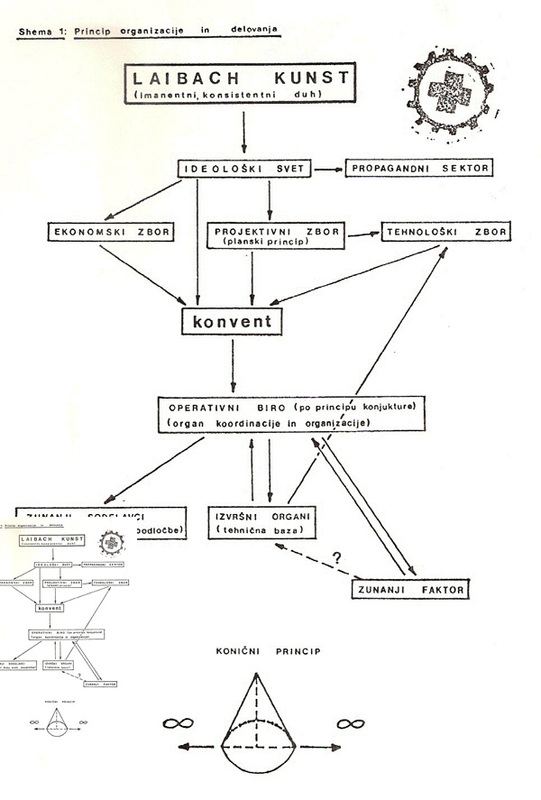 Factors including the use of propaganda as a mode of communication, force projection, continuous positioning towards state power, the ambivalent exploration of 'Sloveneness’, the appropriation and the juxtaposition of contradictory historical and national references produced a paradoxical image which made an accurate political interpretation of NSK nearly impossible for observers. This resulted in numerous accusations and interpretations. Revisiting basic principles and specific events, the session will attempt to re-trace the NSK groups' creative motivations and NSK's impact on the cultural and political shifts that culminated in the disintegration of the Yugoslav state. will expand on the 1987 Poster Scandal, which turned NSK into a folk demon for the wider Yugoslav public and media. NSK's design department Novi Kolektivizem had won first prize in a poster competition for the National Youth Day Celebration but the award was cancelled after the Nazi source of the image was uncovered by chance. The resulting media scandal dominated the headlines for weeks and was NSK's most devastating intervention into the public sphere. will reflect on the role of Laibach and NSK in the fall of Yugoslavia and the creation of the Slovene nation state. He will examine the alternative movements that started in the cultural field, their propagation via independent media and the influence of the alternative scene on historical and political developments in Slovenia and Yugoslavia. Zdenka Badovinac (head curator at Moderna galerija, Ljubljana) will moderate this discussion with guests and audience on the structure of Neue Slowenische Kunst and the symbolic power it asserts through artistic collectivism. The respective roles of the real and virtual groups, their cooperations and specific imageries will be discussed as factors that led to the recognition of NSK locally and internationally at a time when Slovenia was largely overlooked as a site of contemporary cultural activity (as was the rest of the so called ‘East’). The guests in this session were either part of, or witnessed directly the context in which NSK's operations took place. They will discuss the NSK phenomenon from their respective personal and professional perspectives. The audience is invited to join the discussion. The NSK state – a tale of proclamation and its realities. The creation of the NSK state as a collective artistic construction also marked a new phase in the evolution of the retro-aesthetics and positions developed by the Neue Slowenische Kunst groups. The NSK State has gained international attention as a project that breaks down accepted thresholds between art, performance and real life. Appropriating the ‘legal’ paraphernalia of nation states such as the right to citizenship, passports, flags, temporary ‘territories’ and state presentations etc, the state uses state symbolism to annexe new territories for culture, and to escape into previously-unimagined spaces. 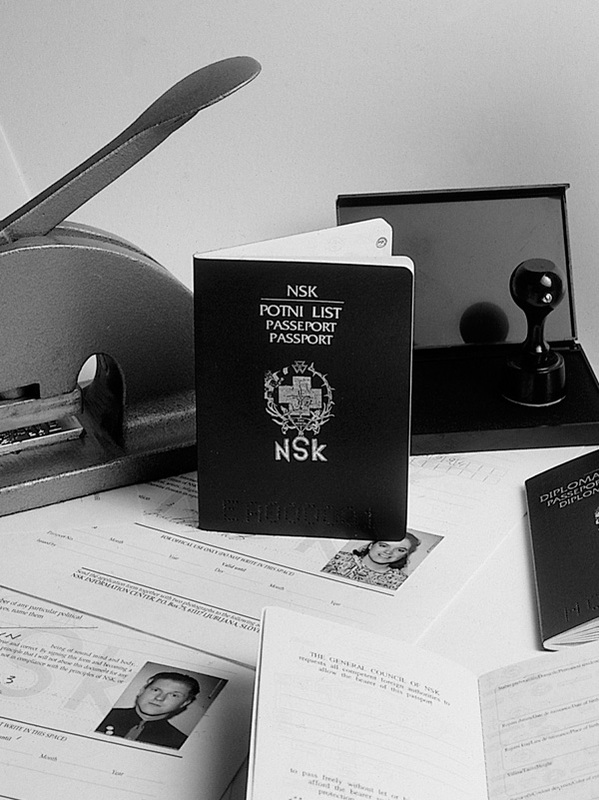 The NSK state was founded during the ongoing disintegration of the Yugoslav state and at a time when the artistic utopia of an independent Slovene state previously invoked by NSK had become a mundane commercial reality. The NSK state as a social sculpture emerged from shifting political realities and its utopian aspect grew along with the growth in the number of its citizens. In the light of the forthcoming first congress of NSK citizens in October 2010, the session will examine the history and potential future of this unique artistic conceptual construction, which has so far had a primarily symbolic existence. What will be the fate of the state if its citizens assume primary responsibility for its direction? What should or will its content be, what binds its diverse citizens and can it assume a new concrete existence? Invited speakers and NSK state citizens will examine such questions and look ahead to the state's possible futures. This session will explore the origins, history and aesthetic elements that constitute the “cultural performance” of the NSK State. The State first manifested publicly in the 1992 NSK Embassy Moscow event and was already embryonically present in early Laibach works and references. What are the implications of this (non-existent) state art Moscow which has manifested itself in the most unlikely locations, both officially and unofficially? What is the function of the NSK state as a form of “social sculpture”, represented mainly within the reflexive circuits of art and culture? What concrete meaning does the state and its design entail for its citizens? will discuss the ways in which the NSK state has been perceived, interpreted and represented first and foremost as an art project. She will analyse the contexts and events in which the state has visibly manifested, its relation to its 'citizens' and their motives for such disjunctive relationship of 'belonging without belonging'. This talk will analyse the early Laibach activities in relation to the large scale utopian state project and reflect on the early use of state symbolism and state-like rituals. As a symbolic entity with plausible statist symbolism NSK state has sometimes succeeded in disrupting and confusing actual state authorities (much as Neue Slowenische Kunst did in the 191980s). However, the NSK State ‘authorities’ have themselves been caught unawares by the unforseeable ways in which individuals in many contexts have identified with and (ab)used it. The existence and growth of this state raises questions about real states, their dystopian and utopian potentials. In what ways has the NSK State been important to date and how might it be so in the future? It is the virtuality of the NSK state, lingering on the dangerous and promising borderland of reality that presents us with both ethical and philosophical questions on the human side-effects and responsibilities connected to this project that works as a utopian promise. The collective nature of Laibach and NSK and their continuing potential as “subversive element” will be discussed in this talk. What are the cultural and political implications within a utopian artistic construction of a virtual state ? The project of the NSK State in time was and remains a highly anomalous one in the fields of both contemporary art and dominant tendencies in both cultural and political theory. The NSK State in Time project goes beyond this historical prescience, however, and seeks to incarnate not an actual state but a virtual state or the state-form itself. Surprsingly, in an era in which most major political thinkers (Foucault, Badiou) had turned away form any real consideration of the state, Deleuze and Guattari, through the concept of the Urstaat and the dynamics between 'war machines' and the state-form as 'apparatus of capture' provide a useful key for approach the NSK State precisely because they theorise it as a virtual form, rather than in relation to existing territories, nations or even state apparatuses in the usual sense. This paper will therefore situate the NSK State in Time in relation to the Urstaat and argue that in contrast to post-Deleuzian anarcho-leftist utopias like Hakim Bey's Temproary Autonomous Zone that attempt to embody an anti-state war machine of nomadic desire, both Laibach Kunst and NSK combine the war machine with the Urstaat resulting in a much more rigorous and crucially sustainable way of introducing profound fractures and far-reaching critique of the current hierarchical system of global capitalist states. Having analysed the history and consequences of the NSK State to date, the final talk and panel discussion will reflect on its possible futures and its role in the 21st Century context. Four weeks after this Symposium the first NSK Citizens’ Congress will be held in Berlin. The session will present some of the delegates to the Congress who will express their hopes for the event and for the future of the NSK State. Can or should it intrude further into the “real” world? Can the citizens assume more responsibility for the direction of the State and what forms might this take? The final fate of this strange project is yet to be decided and these discussions may offer a glimpse into a decisive phase in its story. What could or should the NSK state be in the future, given the premises that it will remain aglobal virtual state with real emotional and ethical adherence to it by its citizens ? As a real utopia it can show values, purposes, ethical standards, political instruments etc. for real governments and parties, and at the same time set standards by which to measure their activities. This talk will provide a contextual view of Kunstderfuge based on interviews with various informants (pianists, journalists, DJs, musicologists). All were asked to note their first impressions, associations and most pleasurable moments. They then analysed the album's musical structure, and gave more general comments on it. This should produce a fascinating insight into one of Laibach's most complex works. 20:00 Peter Mlakar "Sermon on the Mountain"
*Transport between Delavski dom and factories, Mount Kum will be organised. The event is organised by Trbovlje Newmedia Setting and Delavski dom Trbovlje in cooperation with ŠKUC Gallery, Ljubljana. LaibachKunst.com is powered by the Immanent-Transcendent Spirit and handcrafted by the Radial Interactive Forces.